It has puzzled me for a long time why so many Japanese superheroes (Ultra-man, Kamen riders, Voltron or Golion, Go-Onger, Gao-ranger you name ‘em) have bug eyes, unmoving mouths, or no mouth at all and have a strong connection with mime. I now have a theory about the connection between Japanese superheroes and mime. Japanese superheroes make many gestures (see image right), like mime artists. And more, in a sense they also speak. But their mouths are always immovable. Often they do not have mouths at all. And yet they do speak: They mime speech! Typicaly, a group of young males and one female strike poses, press buttons, or contact someone in heaven on a magical mobile phone, and change ("hensin") into a team of superheroes wearing colour coded wetsuits. Why should then even need to change into a super hero suit? There is no secret made of their identity. They then do stylised battle, reminiscent of badly choreographed pro-wrestling, with one or more wetsuited monsters, often with a conspicuously mobile jaw, in a car park. As the superheroes fight they 'speak', or shout, encouraging each other. But where does their speech come from? Their mouths can not move, nor even open. They mime speech. They take out their magic mobile phones and put them to their motionless mouths. All eyes are focused toward the miming speaker. In the mimicry of speech they are much like masked performers in the Noh Play. The body language of the players mimes speech to perfection, but the face does not move at all. Nowhere is the mime aspect of Japanese superheroism more apparent than in the live stage shows performed for children. Performers in coloured mouthless wetsuits come on stage. Someone somewhere presses a button on a ghetto glaster, and off they go, miming their way through an Ultraman epic, never once saying a word, but all the while making it plain who is speaking. The Japanese boys love it. They imitate the gestures, like the ultra-man laser beam pose above. So why is miming speech so important? According to Lacan the human self exists by virtue of two incomplete feedback loops: those provided by voice and vision. We can look at ourselves in the mirror, but we can never see the minds eye. We can speak ourselves, but Lacan argues, the enunciated "I am" of self speech, never quite coheres with the self that would be saying it. However, with two ways back to the self, we play a shell game, or two card monte, always satisfied that when the word does not hit the mark, we can see ourselves in a mirror. And when the mirror seems empty, we can call ourselves by name. The problem remains however, in convincing ourselves that our speech comes from the same place as our mouth. Ventriloquists mime speech even with their lips. The people that we watch on television appear to be speaking when we know that the sound is coming from the speakers at the side of the box. Sound and vision never come from the same place, but we get used to thinking that they do, and the scumble that links the two together, that overcomes the contradiction of a picture that is attached to words, is paramount in the production of self. Japanese boys watch their superheroes mime speech. They know that, on the one hand, their heroes are not speaking. All the people at the show, everyone knows that Ultraman is dumb, that the emperor has no clothes. But the little boys also know that everyone loves and admires the superheroes and that everyone assumes that the superheroes are speaking. They learn that if they take up the mime too, then no one will out them, no one will ever say "Hey, you are only miming." Superheroes and humans mime speech. It is important that they do so. But why the bug eyes? For me the bug-eyes of Japanese superheroes are seen but unseeing eyes. Their eyes are massive. Sometimes the Japanese superhero's face is all eye. But they have no pupils, no in-eye movement to suggest that they see. Their massive eyes emphasise their visuality, but with their lack of inner eye detail, it is though they can not see at all. These eyes are, I suggest, the eyes that stare at us from out of the mirror. Our eyes as reflected mirrors fascinate us, they draw our gaze, we attempt even to look into them, but we know that they are sightless. As I have argued elsewhere, the Japanese are permanently in "the mirror stage" in that, by virtue of their training in and ability to take multiple visual perspectives upon themselves, they continue to identify with self as reflected. Growing up in an world of uninterrupted and loving gazes, mirror identification presents little problem for the Japanese. But in order to developed a self they must also integrate the voice, attach those vocal symbols to this reflection, and hence all this heroic speech-miming. Addendum. Something similar should be going on in the West: there should be some attempt to link phoneme and imago being made. But in the West it is the identification with speech that is less fraught. Someone admirable and heroic should be 'speaking mime' rather than miming speech. Please see this post for an example of a Western hero It has puzzled me for a long time why so many Japanese superheroes (Ultraman, Kamen Riders, Voltron or Golion, Go-Onger, Gao-ranger, you name ‘em) have bug-eyes, unmoving mouths, or no mouth at all and have a strong connection with mime. 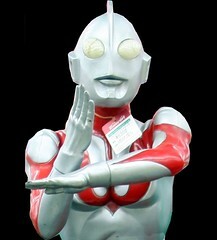 Japanese superheroes make many gestures (see image above), like mime artists. And more, in a sense they also speak. But their mouths are always immovable. Often they do not have mouths at all. And yet they do speak: They mime speech! Typicaly, a group of young males and one female strike poses, press buttons, or contact someone in heaven on a magical mobile phone, and change ("hensin") into a team of superheroes wearing colour coded wetsuits. Why should then even need to change into a super hero suit? There is no secret made of their identity. They then do stylised battle, reminiscent of badly choreographed pro-wrestling, with one or more wetsuited monsters, often with a conspicuously mobile jaw, in a car park. Nowhere is the mime aspect of Japanese superheroism more apparent than in the shows performed for children at Japanese festivals. Performers in bug-eye, multi-coloured mouthless wetsuits come on stage. Someone presses a button on a ghetto blaster, and off they go, miming their way through an ultra-man epic, never once saying a word, but all the while making it plain who is speaking. The Japanese boys love it. They imitate the gestures, like the Ultraman laser beam pose above. According to Lacan the human self exists by virtue of two incomplete feedback loops: those provided by voice (or phonetic language) and vision. We can look at ourselves in the mirror, but we can never see the minds eye. We can speak ourselves, but Lacan argues, the enunciated "I am" of my self speech, never quite coheres with the self that would be saying it. However, with two ways back, two feedback paths, to the self, we play a shell game, or two card monte, always satisfied that when the word does not hit the mark, we can see ourselves in a mirror. And when the mirror seems empty, we can call ourselves by name. The problem remains however, in convincing ourselves that our speech comes from the same place as our mouth. But we get used to it. Get used to thinking that sound and vision come from the same place. E.g. The people that we watch on television appear to be speaking the sounds, even though we know, if we think about it, that the sound is coming from the speakers at the side of the box. Japanese boys watch their superheroes mime speech. They know that on the one hand their heroes are not speaking. All the people at the show, everyone knows that Ultraman is dumb, that emperor has no clothes. But the little boys also know that everyone loves the superheroes and assumes that the superheroes are speaking. They learn that if they take up the mime too, then no one will 'out them', no one will ever say "Hey, you are only miming." Superheroes and humans mime speech. It is important that they do so, and get away with it. But why the bug eyes? For me, the bug-eyes of Japanese superheroes are seen but unseeing eyes. Their eyes are massive. Sometimes the Japanese superheroes face is all eye (Kamen rider Faizu/555). But they have no pupils, no in-eye movement to suggest that they see. Their massive eyes emphasise their visuality, but with their lack of inner eye detail, it is though they can not see at all. These eyes are, I suggest, the eyes that stare at us from out of the mirror. Our eyes as reflected mirrors fascinate us, they draw our gaze, we attempt even to look into them, but we know that they are sightless. As I have argued elsewhere, the Japanese are permanently in "the mirror stage" in that, by virtue of their training in and ability to take multiple visual perspectives upon themselves, they continue to identify with self as reflected. Growing up in an world of uninterrupted and loving gazes, mirror identification presents little problem for the Japanese. But in order to develope a self they must also integrate the voice, attach those vocal symbols to this reflection, and hence all this heroic speech-miming. Something similar should be going on in the West: there should be some attempt to link phoneme and imago being made. But in the West it is the identification with speech that is less fraught. So someone Western, admirable, and heroic should be 'speaking mime' rather than miming speech. I guess that this has something to do with the secret identities of Western Superheros, but for the time being, I don't know what "speaking mime" is. I think, therefore I am Batman. PPS: Just after writing this I saw the trailer for Avatar, where a super-hero kinda guy controls an "Avatar" by remote control and feel like I am chanelling James Cameron. That was very different kind of heroes and they have thier own originalities.